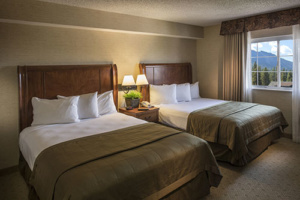 Includes standard amenities detailed above, plus Egyptian cotton sheets and bedding, bathrobes, cozy bath rugs, and hot cocoa. 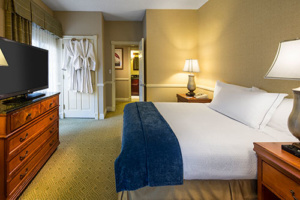 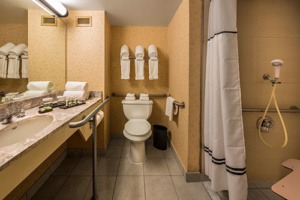 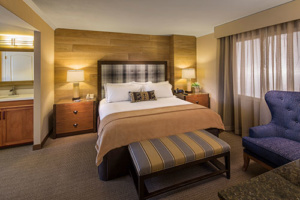 Includes standard amenities detailed above, plus a large outdoor patio connected to the suite, Egyptian cotton sheets and bedding, bathrobes, cozy bath rugs, and hot cocoa. 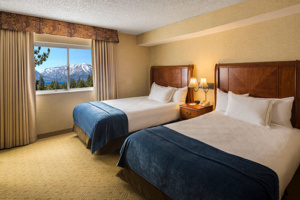 Includes standard amenities detailed above, plus a large balcony with lodgepole patio furniture and a panoramic view of the lake, mountains and downtown, Egyptian cotton sheets and bedding, a basket of bathroom amenities, bathrobes, cozy bath rugs, and hot cocoa. 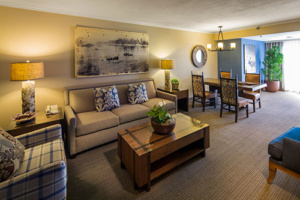 With 1000 square feet of living space, 2-bedrooms, and 2-baths, our second-floor Family Suite is the largest in the hotel. 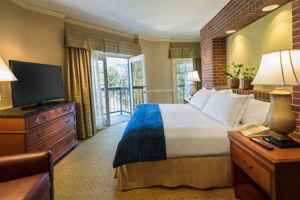 The master bedroom has one king-sized bed with French doors opening to two small balconies. 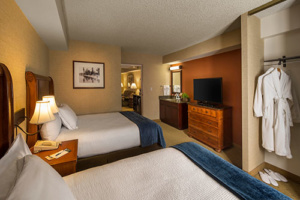 The second bedroom has a large bunk bed (queen over queen) with another small balcony. 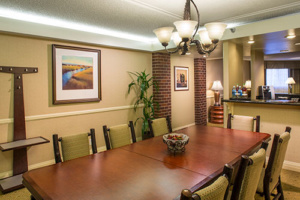 The furnishings include a spacious living room with a 42″ flat screen television, an eight-seat dining table, and a small kitchen. 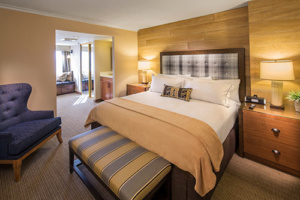 More extras include Egyptian cotton bedding, a bathroom amenity basket, bathrobes, cozy bath rugs, and hot cocoa. 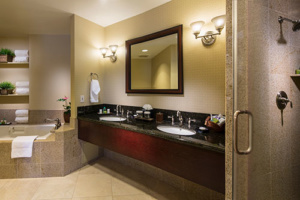 Hotel amenities include complimentary and paid services. 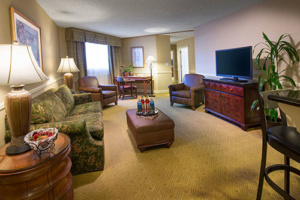 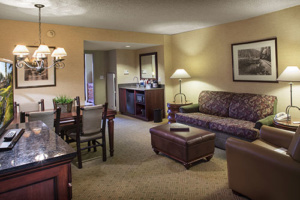 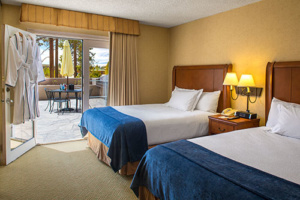 When you’re searching for first-rate accommodations, our resort hotel can’t be beaten! 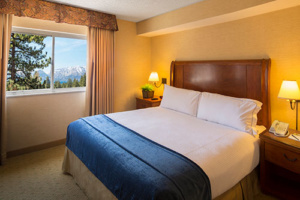 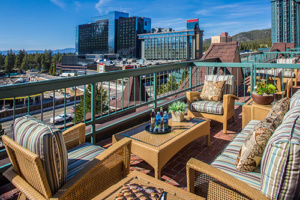 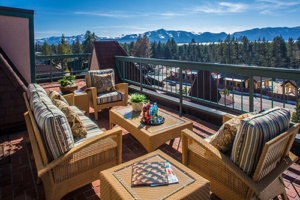 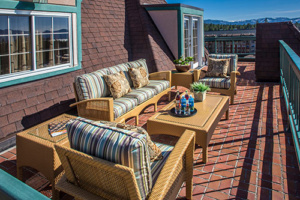 Seasonal Lake Tahoe lodging and recreation packages are available throughout the year.